JOHANNESBURG, 31 March 2019 – Almost two decades have passed since South Africa’s Black Economic Empowerment policy was first introduced, yet transformation in the metals and engineering sector is still painfully slow, with the sector ranking amongst the least transformed in the economy. “Transformation is of paramount importance to South Africa’s future and sustainability. Companies in the metals and engineering sector have begun to embrace transformation, albeit at a painfully slow pace,” SEIFSA Chief Executive Officer Kaizer Nyatsumba said. 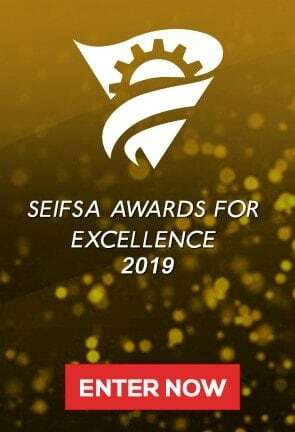 He said it was against this backdrop that SEIFSA continues to advocate for transformation within the sector and, through the SEIFSA Awards for Excellence, also continues to celebrate companies that have gone out of their way to embrace transformation. Mr Nyatsumba said the accolade is awarded to the most transformed company in terms of ownership, the composition of its Board of Directors, Executive Management and Management Team in the period July 2017 to December 2018. The Most Transformed Company of the Year Award category is split into two by company size: the first covers companies employing fewer than 100 people and the second one looks at companies employing more than 100 people. This, according to Mr Nyatsumba, ensures that companies are judged against their peers to encourage fairness. Last year’s winner in this category was Weir Minerals, which had embraced the challenges of the amended Broad-Based Black Economic Empowerment Code, with a firm commitment to using its skills development initiatives as a cornerstone of its transformation agenda. This year, the winning company will, once again, be celebrated during an annual gala dinner to be held on 23 May 2019 at the IDC Conference Centre in Sandton, Johannesburg. Entries for the Awards close on 26 April 2019 for all categories. Along with the Most Transformed Company of the Year Award, the SEIFSA Awards for Excellence have six other categories. The Environmental Stewardship Award will go to a company that has successfully implemented greening initiatives in its day-to-day business operations between July 2017 and December 2018. The Best CSI Award will be presented to a company whose corporate social investment programme/s between July 2017 and December 2018 had a major impact on the lives of its beneficiaries. Mr Nyatsumba has encouraged manufacturers operating in the metals and engineering sector to submit their entries for the seven categories as soon as possible. The Awards are open to all companies in the sector, both SEIFSA members and non-members. SEIFSA is a National Federation representing 23 independent employer Associations in the metals and engineering industries, with a combined membership of 1600 companies employing around 200 000 employees. The Federation was formed in 1943 and its member companies range from giant steel-making corporations to micro-enterprises employing fewer than 50 people.